Every spring, we get a lot of questions from folks thinking of selling their homes. Some think they’ll save money by selling without a real estate professional, so we thought we’d share a bit of insight on the likelihood of success with that method. Sellers often believe that by going it alone, they will end up with more money in their pocket after the sale. Can that happen? Sure. Is that likely to happen? Nope. A common residential sales commission is 6% of the total sales price, and a seller is typically responsible for paying that. Sellers rightfully look at their bottom line- what they’ll net after the sale- and the prospect of saving 6% of the total sales price can, particularly on a luxury home, mean tens of thousands of dollars. But does For Sale By Owner (FSBO) really work? A recent Wall Street Journal article offers some valuable insight: A National Association of Realtors (NAR) survey shows that a mere 8% of all homes sold in 2017 were sold as FSBO. Many sellers underestimate the time and skills necessary to do what a qualified Realtor does. In fact, here’s a list of 185 tasks a listing real estate associate is responsible for. Do you want to take on 185 extra tasks? Trust us, it ain’t easy! 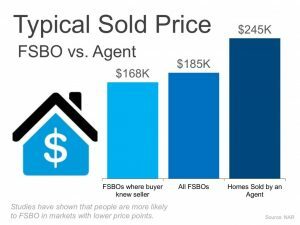 According to PJ Mitchell, president of fizber.com, a website that provides services to FSBO’s, only 18% of homes that sold after being listed on Fizber were sold without the MLS (the Realtor database of listings). In addition, a whopping 70% of sellers who first posted a FSBO listing with Fizber ultimately hired a real estate professional to sell their home. Why? Because it ain’t easy! The WSJ article also included this important statistic: In 2017, homes listed with a real-estate agent had a median sales price of approximately $250,000, compared with approximately $190,000 for owner-listed homes. Even factoring in a 6% commission, the agent-assisted sale would still net $235,00, a dramatically higher number than the FSBO net sale price. Bottom line? You may be one of the 8% of sellers who succeed in selling your home as a FSBO. But keep in mind- time is money, and timing in real estate is critical. If a home is priced too high initially and/or sits on the market too long, the chance of a successful sale with a price the seller is happy with decreases tremendously. Springtime, by the way, is the prime season for homes sales in the St. Augustine, Ponte Vedra, St. Augustine Beach, and Jacksonville areas. More buyers are actively looking now, more buyers have deadlines to purchase now, and more sellers see higher sales prices than any other time of year. At 97Park, we give you our word: We will work diligently to position your home to garner the highest price possible in the shortest amount of time. We won’t overpromise and we won’t underdeliver. We will work hard every single day for you. And we’ll be accountable to you. No flimflammery. Call us today. Let’s sell your home!